I personally have always admired Dame Josephine. She has lived an extraordinary life and will continue to inspire the women of Papua New Guinea and other Pacific islands. Thank you Veronica Peek for writing this story and sharing it with us. When I look back now on those seventies years in Papua New Guinea, there is one politician who stands out as personal favourite, and that is Dame Josephine Abaijah. In those days when she had no title, Josephine and I were neighbours of sorts. She owned a news agency in the Port Moresby suburb of Boroko and it was at street level, of course. Up one flight of stairs and directly above her shop was a suite of rooms where I had my photography studio and darkroom. If the acrid chemical smells emanating from said darkroom ever troubled her, she didn’t say so. My memory of Josephine, then, is of a dainty, impeccably groomed lady behind a counter who served me my copies of Australian newspapers and magazines. Thing is though, she wasn’t always there. This little lady had bigger fish to fry. That’s true Alex. I hope more get into leadership. Thank you for sharing Alex. I am glad you appreciate Josephine’s story. 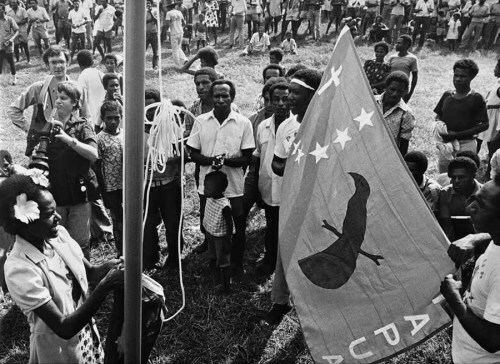 She led Papua Besena (mostly men members) with the intention of breaking away from PNG. She was daring and brave and quite intelligent. I really admire Josephine Abaijah for “In a country where women usually have little or no status, it seems remarkable that she was able to muster so much male support”.